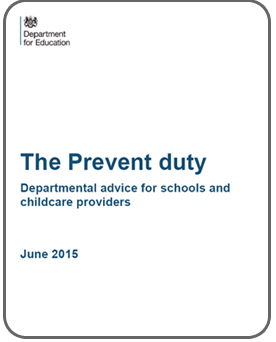 A selection of items is provided below to support schools with various aspects of news and information relating to supporting schools with the revised Prevent Duty. Additional information not covered below can also be found in the 'FAQs / Help' section accessed via the tabs above. Lancashire Safeguarding Boards have re-subscribed on behalf of all schools across the Lancashire region to the popular D2-Digital resource Where's The Line? The renewed subscription will allow schools across Lancashire, Blackburn-with-Darwen and Blackpool to continue to access the resource free-of-charge through to June 2020 and includes a suite of topics with 25 interactive resources. The resources include supporting materials to provide teachers with the means and confidence to help students safely explore, understand and learn about extremism through an online platform. Each topic contains a number of aspects and supporting lesson plans which can be used as-is or further developed upon to reflect local requirements. Each lesson plan includes questions, suggested prompts and supporting comments to help teachers explore each area. In order to access the interactive resources, schools will need to register their school account through the creation of a school Username and Password. On completion of the registration process, colleagues are able to access the full range of resources which are split across 5 separate topics. The link to the Where's The Line? resource can be found in the 'Secondary Resources' section on P4S. Counter Terrorism Policing (CTP), the PSHE Association and Girlguiding have released a freely-available set of resources designed to teach young people how to react if caught up in a gun or knife terror attack. The resources include an animated film which can be delivered as part of a comprehensive practitioner pack with guidance notes and age-appropriate lesson plans for Key Stage 3 and Key Stage 4. The resources are focussed around the ‘RUN, HIDE, TELL’ theme, extended to include ‘TREAT’ with guidance notes, lesson plans and powerpoint resources from St John Ambulance on administering First Aid. A link to the ACT for YOUTH resources is available in the 'Other Recommended Resources' section on P4S. A link to the PSHE resources is available in the 'Other Recommended Resources' section on P4S. Further to the recent consultation, the Department for Education has released the revised statutory guidance for schools and colleges which came into effect from 5th September 2016. The guidance (updated from the previous May 2016 version) features a number of notable changes including specific sections on Preventing Radicalisation (Annex A, pg 56) and Online Safety (including appropriate filtering and monitoring expectations (Annex C, pg 62)). Prevent Tragedies has launched a short film that describes the devastation caused to families whose loved ones have travelled or attempted to travel to a conflict zone, like Syria. Left Behind focuses on the accounts of four police Prevent contact officers who have supported families from across the country and witnessed first hand the anguish they go through as a consequence of a family member's actions. From the initial shock through to the disruption to families, the officers talk frankly and openly and appeal to people who are concerned about a loved one who may be considering travel, to contact the police before it is too late. Further information and related links are available in the 'Other Recommended Resources' section on P4S. The public can now report online content they suspect may be of a violent extremist or terrorist nature direct to a specialised police unit. Clicking on the red 'REPORT' button (see right) or using the link below will take users to a dedicated online reporting site which can be completed anonymously. In response to regular enquiries received, the enclosed P4S Online Radicalisation guidance has been developed by Lancashire Safeguarding Children Board colleagues to support addressing Online Radicalisation as part of the broader Online Safeguarding agenda in schools. The guidance provides a number of considerations and recommendations for schools as well as signposts to a range of freely-available supporting tools and resources. The Government have released an online e-learning resource designed to help raise awareness of radicalisation and support staff to identify the signs that someone may be at risk and where to go for support. Further information and related links are available in the 'Other Recommended Resources' section on P4S. 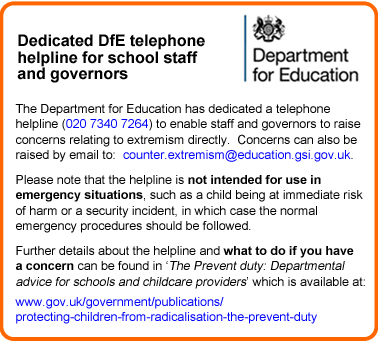 As identified in the above departmental advice, the Department for Education has recently launched a dedicated helpline for school staff and governors wishing to report a concern directly. Note: The helpline is not intended for use in emergency situations. Information on the helpline including what to do if you have a concern can be found on p.10 in the Departmental Advice publication below. Statutory guidance for specified authorities issued by HM Govt on the duty in the Counter-Terrorism and Security Act 2015. All specified authorities must have due regard to the need to prevent people from being drawn into terrorism. Issued March 2015 and revised July 2015. There is increasingly widespread recognition that terrorist and extremist organisations are utilising the Internet and Social Media for the radicalisation and grooming of Young People. Further to this, the Department for Education and the Home Office have issued the joint enclosed briefing note for schools re: Social Media being used to encourage travel (see link below) highlighting some of these aspects and actions schools should take. The National Counter Terrorism Policing Headquarters (NCTP HQ), in conjunction with the College of Policing (CoP), have launched an e-learning module on 'Channel General Awareness' on the College's Managed Learning Environment. Channel is a multi-agency process designed to safeguard individuals. It includes information on how Channel links to the Government's Counter-Terrorism Strategy (CONTEST) through the Prevent Strategy. It provides guidance on how to ‘recognise, understand and refer on’ around people who may be vulnerable to radicalisation. The package takes approximately 25 minutes to complete. The demands placed on all staff are acknowledged, however, given the current threat faced completion of this knowledge package and refreshment of previous advice is recommended to support further awareness and understanding. The package has been trialled internally and externally in Lancashire and feedback is very positive. Departmental advice for schools from the DfE on promoting pupils’ Spiritual, Moral, Social and Cultural (SMSC) development, including what is expected of schools in promoting fundamental British values and how this aligns with schools’ duty to promote SMSC. Schools should promote the fundamental British values of democracy, the rule of law, individual liberty, and mutual respect and tolerance of those with different faiths and beliefs. A report commissioned by the DfE presenting the findings from a large-scale, in-depth research study into teaching methods – knowledge, skills, teaching practices and behaviours – that help to build resilience to extremism. The focus is on teaching methods to be used in a general classroom setting rather than as part of interventions targeted at those deemed at risk of extremism.